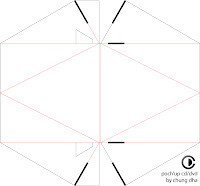 Here are the templates to fold the dynamic cd packaging. 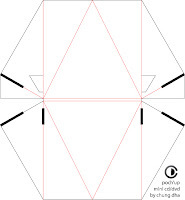 Fold the red lines and cut the black ones. A tip to fold it easier and straight, is to use an embossing pen to trace the lines to it is easier to fold. If you want to make this without having to print the lines over the design, print this templates on a loose paper and trace the lines using a lightbox and an embossing pen. This way could make a cool design on this template without having to see these lines. Also it is best to fold every fold first and then paste it together. Print them out with 72dpi and without fit to page or scaled. If you want to have a PDF file of these templates, you have to e-mail me your information and why you want to use this for. Keep up the great Art works. Hello, i was just trying your poch up template and i think that i find where can be one of the problems why it doesn´t stay up and right at the end, well i apreciate on this video http://www.youtube.com/watch?v=d0BzwBECQM8 on one of the transparent poch ups that there are two little labels going out of the packaging at the base of it, so i deduce that its a kind of mechanism to allow the packagnig stand up by fitting the two sides, just like you do on the laterals of itself, the other think i go for is that the parts of the inside are just too large and that they are colliding and providing resistence, so i am going to try doing them shorter.... i don´t mean that you hadn´t try this solution or any other, i am just trying to help becouse of the problems that you let us notice on the video, i hope you find this helpfull.